My Ashland Bay Blue Face Leicester Top BFL Undyed Spinning Fiber arrived from Paradise Fibers and I had one goal for this weekend. As I mentioned last week, I’ve been keenly interested in Navajo plying. 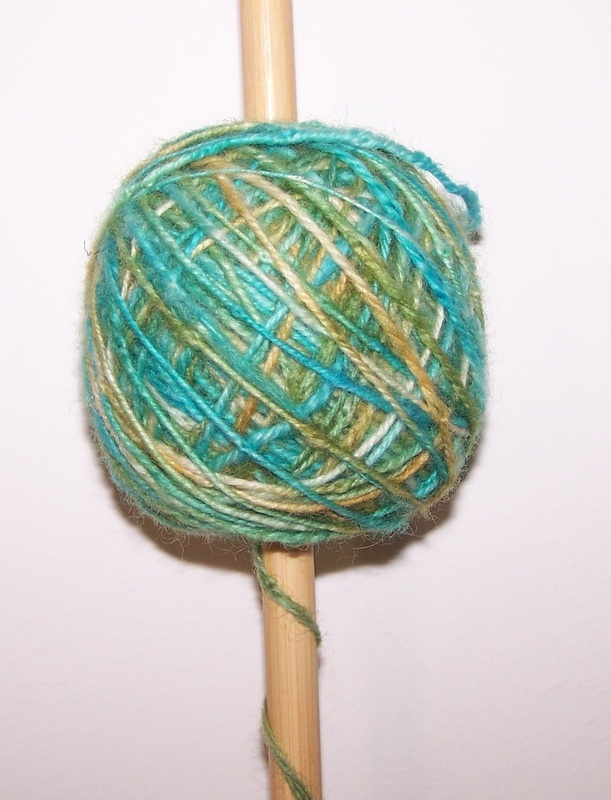 I sat down Friday night, finished a bobbin of one ply yarn for the above wool. It was so easy to work with. I’m actually having to overtwist it so it doesn’t unravel on me. Then I took it off and started navajo plying. I have a few issues with this technique. 1- Starting it is difficult. I kept loosing it when trying to get it to take on the bobbin. Finally I made a knot onto the starter yarn. 2- I’m getting a lumpy yarn. I think when I’m plying, I’m loosening the fibers and creating bumps. 3-Breaking. As I was plying, it kept breaking. 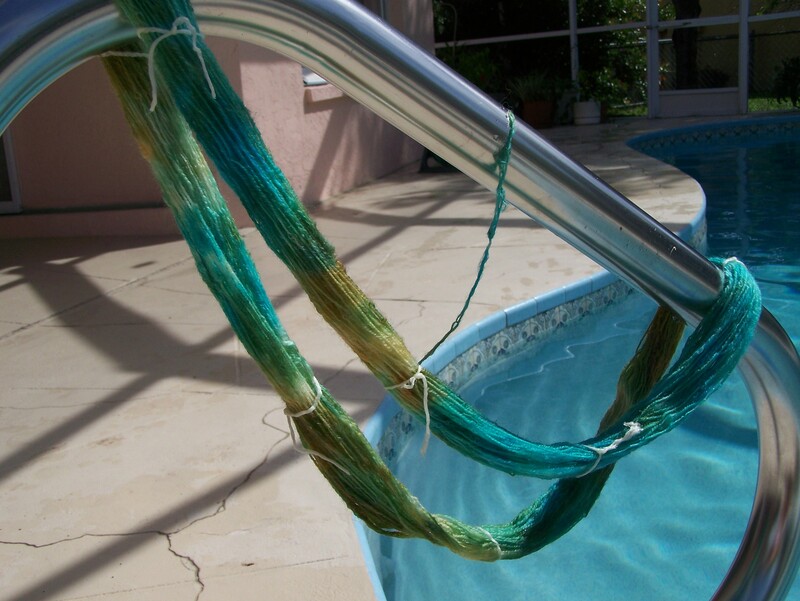 The finished yarn came out unbalanced and different widths but I decided to dye it anyway. I read this over and over and over. First I soaked the yarn overnight in 1/3 cup of vinegar. 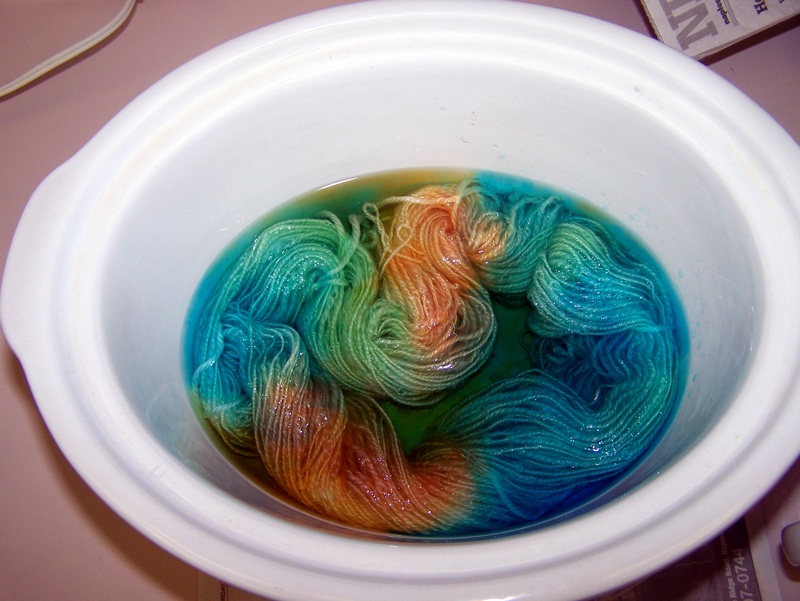 Then, I woke up early and put the yarn in the crock pot with 1/2 cup of vinegar and just enough water to cover the yarn. I wish I had put less water in. 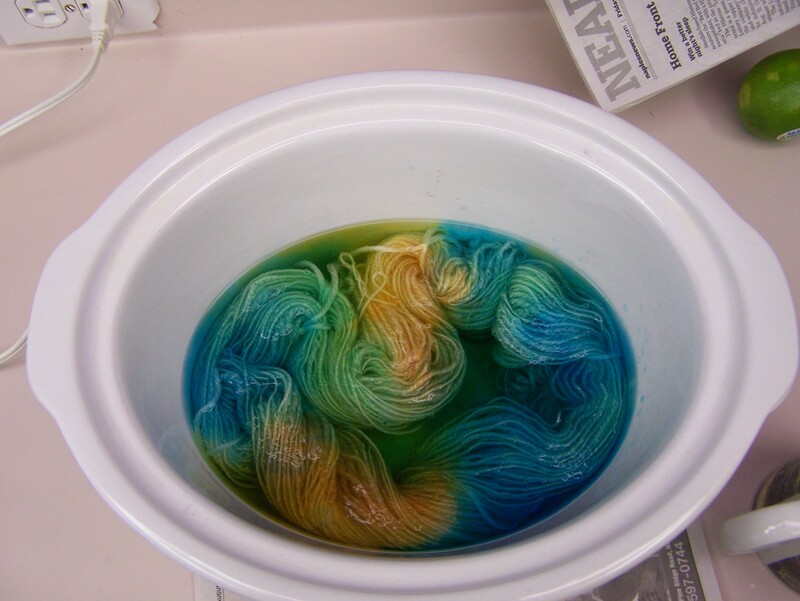 After a little over an hour, I mixed my dyes with hot water and began covering the yarn. 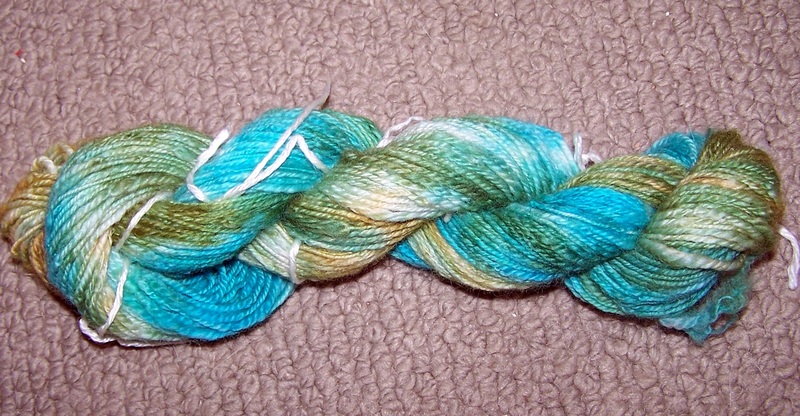 I was really going for a blue and orange yarn with spots of green, but the colors muddled a bit. This is really a clean process though. I had no spills or stains. I added more dye, not liking that the colors were so light. I believe this is why I got the muddled colors. By the end, there was too much water in the crock pot. So below is half of the final product. The colors weren’t what I was trying for, but all in all, I think it worked out very well. I have been chock full of ideas in this last week. I’ve ignored the housework and have been focusing on fiber related projects. 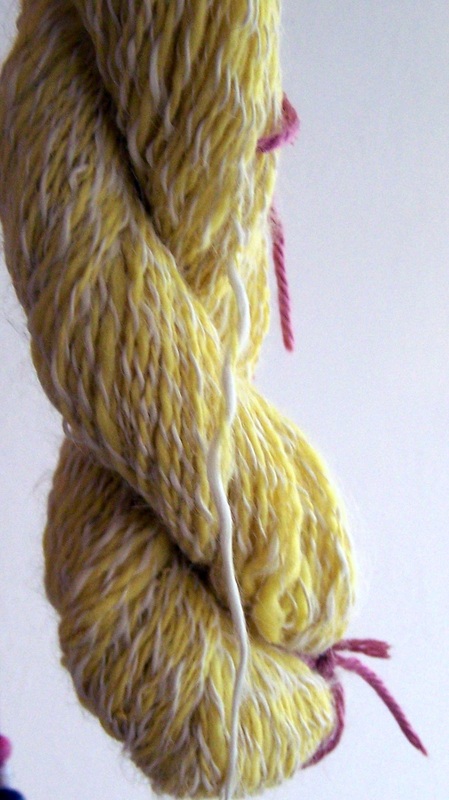 I spun up a skein of white alpaca and yellow wool plied together. This came out perfect and I’m really happy. However, I had some left over potluck wool on one of my spools so I decided to try navajo plying, which is spinning one ply into a three ply by creating loops with one hand and controlling the twist with the other. It took a little bit but I caught on and can’t wait to try it again. I have some wool/mohair mix that friend gave me and I decided I would try a few new things that I’m looking forward to. It spins up real easily. I started this yesterday and then the hubby and I went to a neighbor’s party. I don’t know if anyone else has this problem, but if I have more than one drink, I can’t sleep! So, I wake up repeatedly this morning and finally around 6 am I give up. With a glass of water and a cup of coffee, I sit in front of the spinning wheel.The rest of the wool/mohair mix spins up quickly and I go to navajo ply it. I try and try and try but I can’t get the flyer to pick it up. The yarn keeps breaking. I was really looking forward to navajo plying and then dyeing it with food coloring. Uh well. I finally give up and pick up my socks that I’m making with my homespun. Filled with frustration, I rip out what I’ve already done. I’m using Judy’s magic cast on for toe up socks. I love the book, Socks from the Toe Up. 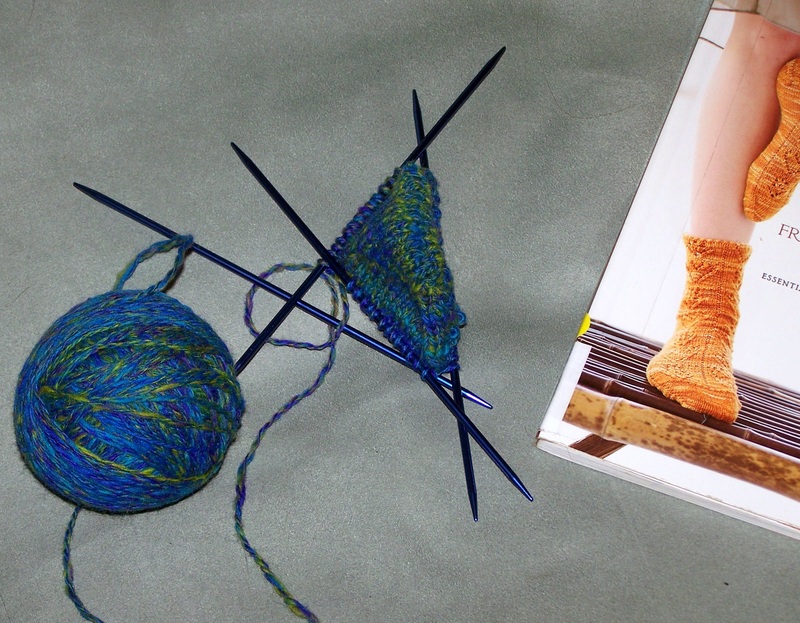 I think toe up socks are easier to do and better for someone like me who tends to drift from the pattern and think, “I know how to do this.” You can try it on as you go along and can fix problems as they come up. The problem I have with the Judy’s Magic Cast-on is that it is easy to create a whole in the toe area if your cast on/knitting is not tight enough. I had tried this twice before and decided to switch to smaller needles. I am a simple sock maker and wanted to try something a little nicer. I try different patterns on the top of the sock and can’t seem to get anything to look right. 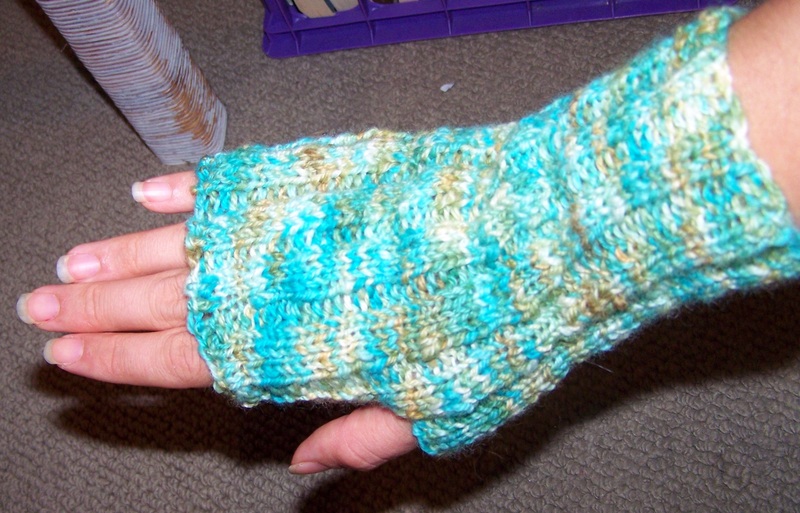 The yarn is variegated (or closer to muddled) so it should be a simple pattern. I’m now on my fifth attempt trying a seed stitch pattern. Oh, and I don’t like how it looks. Sigh.